It was 1 a.m., raining, and it was becoming ever more clear that we weren’t getting those Milky Way shots we had planned on. We’d been camped in the car all night, waiting on the lightning to pass. We had even shown up that previous morning at the crack of dawn, first in line to get one of the 20 free backcountry camping permits they give out per day. Yet, due to weather conditions, we sat in our car for another hour before deciding the lightning was a safe enough distance away to head out for the dunes. We headed out just as it started to rain, and even in the dead smack middle of summer, it felt cold. 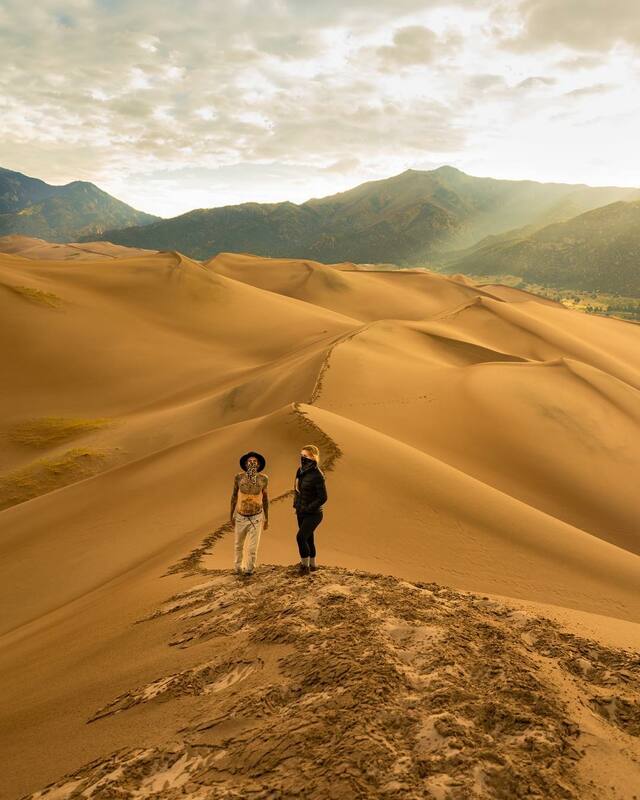 The Great Sand Dunes National Park sits at an elevation of 7,500 ft, so even summer nights can get chilly there. We crossed the Medano Creek, which was just a trickle this time of year, and argued briefly over the right “path” to High Dune. Unable to see more than a few yards in front of us, even with our headlamps, we headed towards what we thought was the right trail to High Dune. Let me make something clear: there is no one trail to High Dune. In fact, there isn’t a marked trail at all. We found the best way to get to High Dune (as we could not see it this late at night) was to put it in Google Maps and head in that general direction, while attempting to spot and stay on the dune ridges. When the sun finally came up and we looked back at our footprints, we laughed. We had probably zigzagged an extra mile around the sand dunes in the dark, avoiding a much clearer path that was now visible in the morning light. The view from High Dune. High Dune is the second tallest sand dune in the park at 650 ft, with Star Dune being the tallest at 750 ft. Surrounded by the picturesque Sangre de Cristo and San Juan Mountain Ranges, this unique hike is unlike any other. Pausing for a moment to take it all in. To hike to High Dune and back, you’re looking at a difficult 2.2 miles, with 650 ft elevation gain. Don’t underestimate the lack of elevation and distance. Have you ever hiked uphill through sand before? It’s like taking one step forward and two steps back. After a few minutes, your legs start to feel like there’s a brick attached to your feet, and you aren’t sure if they are getting heavier from fatigue, or due to the massive amount of sand that pours into your hiking boots with every step you take. Stay along the ridges, not the slopes, for better footing. At least on your way up. Coming back, we found it quickest just to slide down the slopes with our feet, kind of like skiing, minus the skis. What took us about 2 hours to hike up in the dark took us 15 minutes to hike (or slide, rather) down. Bring water. Lots of it. Especially if backcountry camping on the dunes, as there is no water source. Plan to get dirty. By the end of the hike, every crevice of our bodies had sand in it. In fact, I think my hiking boots still have sand under the soles from that hike. It’s best to wear tall hiking boots, but either way plan on getting sandy! Check the weather!! This should always be something you do when planning a hike. But whereas we usually hike rain or shine, going out on the dunes while it’s lightning is extremely risky and dangerous. We encountered unexpected lighting during our trip, and rather than risk it and camp on the dunes, we waited it out. Factor in your health. This trail may not be suitable for those with knee or ankle problems. Have fun!! This will be one of the most unique and rewarding hikes you’ll ever experience. Enjoy the views and have fun!! Just south of the Great Sand Dunes National Park lies a short, rocky, uphill hike to Zapata Falls. Located at the base of the Sangre de Cristo Mountains, this .5 mile hike uphill to the falls is not to be missed. The drive up the mountain to the parking lot alone gives you breathtaking views of the landscape. You can see the rolling Great Sand Dunes contrasting against the rugged Sangre de Cristos to the north. We recommend having a high clearance vehicle to drive up to the base of the hike, however we made it just fine in our two door Scion tC. The hike climbs up a wide, rocky trail. Upon reaching the top, you must wade through the ice cold water through the rock canyon to see the falls. We recommend this hike for the summer, as the hot temperatures make the freezing cold water feel more tolerable. What was a memorable hike you’ve encountered? Have you ever hiked in sand before?? Leave a comment below! Looking for more hikes to do in Colorado? Check out these posts below!